Meadowbrook Park is probably best remembered for the Ballroom and the dances, wedding receptions and company picnics that were held in and around it over the years. However, Meadowbrook Park has a rich history and is an important part of the future of the Seneca County community. Located in Bascom, Meadowbrook Park originated in the late 1890's as part of several local business ventures. The "Old Meadowbrook Park" was located on the north side of Wolf Creek with it's entrance to the west of the Gem Manufacturing Company. Actually it had it's beginnings as part of the Tiffin, Fostoria, and Eastern Railway (commonly known as the Old Street Car Line or Interurban). Tiffin industrialist and banker, Samuel Sneath built the line and the railway had it's power barn along the Wolf Creek in Bascom. It was centrally located between Tiffin and Fostoria. Mr. Sneath, at the urging of his wife, who was a national officer in a women's conservation organization interested in preserving parklands, established a park on the property. Many interurban lines established such parks to draw riders on the weekends for picnics and recreation. Mrs. Sneath supervised the landscaping and the construction of a dance pavilion in 1900, which was built on high poles to protect it from the frequent flooding of Wolf Creek. Leading down to the pavilion was a raised boardwalk that extended from the street car line on route 18. A baseball diamond was also laid out and the two facilities soon became a popular destination. Baseball was a very popular sport at the turn of the century and every town had a team and Meadowbrook became the place to play as the pavilion provided stage shows and dances to make the excursions a complete day. The original pavilion (the first dance hall) was destroyed by fire in 1925.
with a $350 loan. He is credited with having the first circular saw mill in this section of the country. The Matthews family established Matthews Boat Company and later moved the company to Port Clinton. Mr. Haugh established a wood working factory that manufactured many household products made of wood. Shortly after Mr. Haugh took possession of the property, the dance hall burned to the ground. others. He undertook a two year project to develop the 160 acres of land across Wolf Creek. Plans called for a swimming pool with a sand beach, a small wadding pool, a miniature railroad, a four wing reunion hall, a large dance pavilion, boating on Wolf Creek, horseback riding trails, cottages, baseball diamonds, and tennis courts. Most of the construction was done in 1928 and 1929. In June of 1931, a Grand Opening was held and according to news accounts, 3,500 visitors were on hand for the event. Thus the beginning of the tradition in Bascom of celebrating Memorial Day on the first Sunday in June to coincide with the opening of the park and pool for the summer months. This event is still carried on with a large parade sponsored by the Bascom Lions Club. The park is full of visitors who come for the annual chicken BBQ and watch the parade which usually has 80 units and lasts for 90 minutes. The parade still ends in the park and the Lions Club treats the participants to refreshments and the park still allows the participants to cool off by taking a dip in the pool free. was used with only minor maintenance for 50 years before major renovations were needed. The pool was replaced by a major renovation effort in 1980. Under the direction of Park Manager, Wayne Hoover, a federal outdoor recreation matching grant was obtained and a new stainless steel pool was built in the same site. The cost of replacing the pool was $214,000 of which half was raised by the local Bascom community. Recently a new slide was added for children to enjoy. one was ever charged with the crime, but the "old timers" still believe they know who did it. Reconstruction of the dance hall for the third time was started immediately, but was delayed because of Mr.Haugh's untimely death. James Garfield Haugh died On October 4, 1933, at the age of 52. Mr Haugh had a heart attack while attending a wrestling match in Fostoria. over 60,000 board feet of Redwood, 73,000 board feet of Southern Pine and 14,000 board feet of Hard Maple flooring. In all over 154,000 board feet of lumber were used in the construction of the Ballroom. Naturally all of the wood was supplied by the Gem Manufacturing Company. Mr. H. L. Walter, who Mr. Haugh had hired as manager of the Meadowbrook Park Company, stated that the beauty of new Ballroom had increased attendance on Sunday nights to over a thousand admissions, which was a 30% increase. In 1930 Mr. Walter and his family moved into the only cottage that was finished and as luck would have it the only one to be built. Miller Band and many others provided the music that drifted out the open windows of the Ballroom and across the park grounds on a balmy summer evening. Ernie Duffield's band was the house band for the Saturday dances. Clayton Decker and his Red Shirts became the house band for the Sunday night round and square dances. Decker's Red Shirts played at Meadowbrook for over 25 years, celebrating their 25th anniversary in 1963. In later years The promenade of the Ballroom was used for roller skating. graduations, and a Cotillion Club from Tiffin. The Ballroom is also host on a recurring basis to the Tiffin JC's fund raiser dance, the Tiffin Athletic Booster's fund raiser, and several Fraternal Organizations from both Tiffin and Fostoria who sponsor either picnics or dances. This past year two regional businesses utilized the Ballroom for their trade shows. The Ballroom is also the site of the "Amistad" reunion for the Spanish American's who have settled in Northwest Ohio. We have also hosted the Seneca County Senior Citizens, who wanted to relive memories by having a picnic with music in the Ballroom. In all, the beautiful Redwood Ballroom serves the recreational needs of 54,600 individuals of various backgrounds and interests during the year. Other aspects of Mr. Haugh's vision were rapidly being built in the same time period. Six reunion halls were built, each named after the trees surrounding them. A checkerboard, playground, tennis courts, and a new ball diamond were built. Brooks Peters operated the motorboats that took people on rides in Wolf Creek from the Dam west to the old swimming hole near what is now the site of the Hopewell(c)Loudon football field. Ponies gave wild west rides to kids and "Fuzzy" Wyans kept the miniature autos running. Outdoor movies were added in 1936. Corporation. In 1948, due to a cash flow problem, the Park Company was placed in receivership. Mr. Gilbert Creeger was appointed receiver and he operated the park for a ten year period ending in 1958. At this time the Seneca County Probate Court appointed three people to administer the shares in the company held by the Haugh Trust. The park operated in this manner from 1958 until 1972. 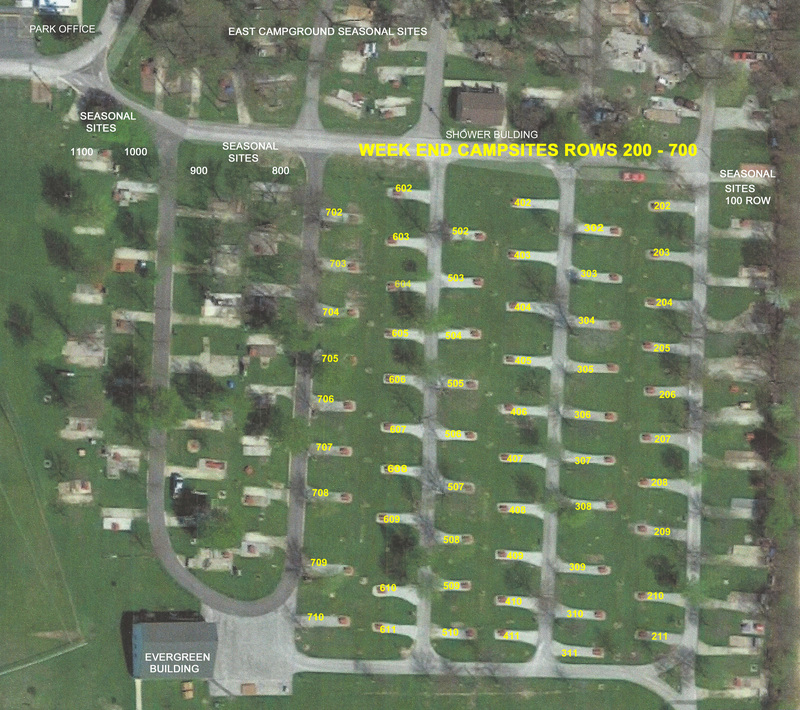 During this time Meadowbrook Park began to change by adding a family campground with 36 sites. In the ensuing years between 1972 and 1997 the park has shifted from an emphasis on the amusement or "theme" park to the family orientated campground and community park that it is today. Moving from the old time amusement park atmosphere to a community park was a direct result of the efforts of the people in the community who wanted to maintain the park for future generations. The Reverend Paul Eichar, who was one of the trustees appointed by the court, approached Wayne Hoover who was the township clerk and asked if there was any way to transfer the park ownership to the Township Trustees. The state had recently passed some legislation that allowed townships and counties to establish park districts and the state Attorney General rendered an opinion based on the Cy Fray doctrine that would allow the probate court to allow the park to pass from the trust to the township. This would fulfill the original tenant of Mr. Haugh's will in leaving the park to the "community". Mr. Hoover worked on this transfer for two years. In 1976 the park officially became a township park owned and operated by Hopewell Township. Mr.Hoover became the Park Manager and held the dual role of Township Clerk and Park Manager for ten years, retiring from both positions in 1986. During the 70's and 80's camping became the major focus of the park. This activity provided the funds to allow the park to continue to grow and pay its own way. The original campground had 36 sites and grew to 225 sites by the summer of 1986. The Hopewell-Loudon Young Farm Wives Organization provided funding for the Evergreen Building on the grounds to serve the needs of their organization and the needs of the camping clubs. The Hopewell(c)Loudon Young Farmers established a tractor pull track on the grounds which later became a mud bog facility that was home to the Mid Ohio Mud Bog Championships. Other recreation facilities added during this time were new tennis courts, basketball court and a new ball diamond was established for little league play on the site of the old out door movie area. The Bascom Fire District's Annual Lawn Fete was moved from the crowded fire station to Meadowbrook Park where it has flourished, becoming an important community event which is more of an annual homecoming. There is total community involvement in preparing for the event. Each community group has taken responsibility for certain aspects of the Lawn Fete. The Fire District has contributed to the improvements to the park to enhance it's Lawn Fete and this adds to the park's resources which in turn offers better services to the community. During the period from 1986 to the present, Meadowbrook has added three picnic shelters to help serve the increased interest in family reunions and community gatherings. The first shelter erected during this period was the Poplar Shelter in 1987. Following the successful community celebration of Bascom's Sesquicentennial the profits from the event added the Ash Shelter and the sidewalk to the park from route 18. In 1994 the Walnut Shelter was replaced by a new unique structure built on poles and spanning the small creek in the park. The Walnut was constructed from recycled plastic and aluminum materials. This shelter, funded by a grant from the Solid Waste Disposal District and made possible with help from the Hopewell-Loudon Young Farmer Organization as the grant recipient and their desire to place the shelter in the park. In 1991 Meadowbrook received a Community Block Grant to build a handicapped accessible restroom in the park. This was followed the next year by another block grant to provide a treatment plant for the restroom and a new campground in the west woods, including a shower building. This campground was developed for seasonal campers, who become part of the local community for the summer. In the summer of 1997 Meadowbrook Park was successful in adding to it's recycling demonstration project by gaining a grant to purchase and install a Play System made of recycled materials. This system allows 35 children between the ages of 2 to 12 to play on the equipment at one time. Meadowbrook Park has also brought back the Checker board and placed two Shuffleboard courts next to it at the original location amid the shade of the Hickory trees in the middle of the park. Today Meadowbrook Park annually serves a very large and diverse constituency throughout an average year. Each year, 130 families have Meadowbrook Campground as their summer address. On weekends the Park serves an average of 500 people in the campground. There are also 246 families with family pool memberships. Crystal Pool averages 348 swimmers per day during the summer season. Meadowbrook Park serves as a regional meeting center for family reunions. The park has ten picnic pavilions that are filled every weekend during the summer months and into October. The number of people who meet under these roofs is estimated to be 51,660 per season. Meadowbrook Park still adheres to the ideals set forth by Mr. Haugh in that the Park still provides employment for the youth of the community. Each summer the number of employees at the park increases to 19 people from the winter crew of 2 full time and 6 part time employees. Meadowbrook Park has assisted many young people in their quest for a college education and helped them establish themselves as productive members of the community. In any given year Meadowbrook Park serves the people of Northwestern Ohio with a wide variety of recreational activities and is an important part of the park system in the State of Ohio. The average number of people served during the year is placed at just over 127,000 individuals from all walks of life and backgrounds. This is a population that far exceeds the daily population of Bascom and indeed the county as a whole which according to the 1990 census has a population of 59,733.